Preposition Killer, Qu’est-ce Que C’est? 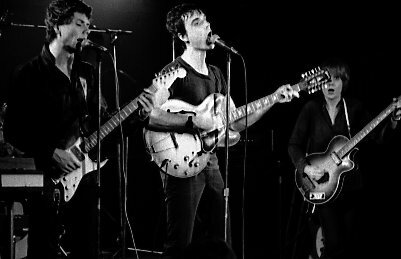 Talking Heads at Horseshoe Tavern, Toronto, in 1978. Photo by Jean-Luc. Courtesy of Wikimedia Commons. Regular readers will remember the utter dismay I have when I see the phrase “on how” – especially when a writer simply wants to say “how” or means “about” or “regarding,” which some regard as old-fashioned. You can imagine the look on my face when I encountered not one, but two examples of “on how” in my favorite magazine, the typically erudite and well-edited Economist. The horror! Oh, the horror! This entry was posted in Grammar and tagged Economist, grammar, present participle, Talking Heads by Vickie Bates. Bookmark the permalink. Thanks for this reminder on how NOT to use “on how”. The phrase is not exactly wrong, but many times it’s too much when more concise wording will do. Thanks for reminding me of a favorite old TV show! Those Lost In Space episodes were classics, weren’t they? I came across the show while channel surfing one night in our hotel in Jackson Hole!